Are you ready for that weekend adventure you’ve been craving? You know what we’re talking about. 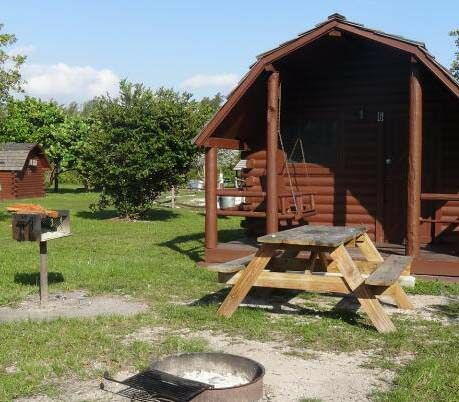 A camping trip has been nipping at your ankles for months and now you’re finally ready to pack up the family and go to one of the 25 Best Campgrounds Within Two Hours of Miami! But we know it can be exhausting putting in the time and research to find the right campsite. 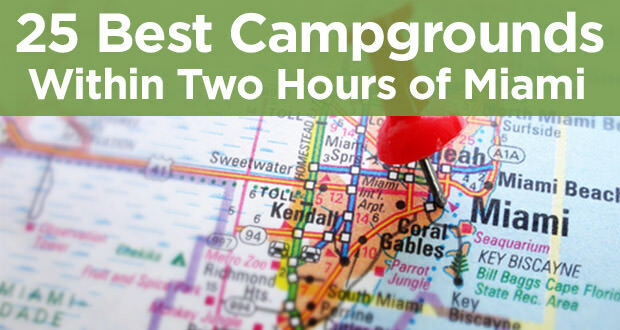 Lucky for you, we’ve done most of the work and created a compilation of the 25 Best Campgrounds Within Two Hours of Miami Florida right here for you. 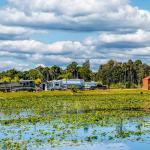 Florida has been said to be the most popular RVing and camping destinations in the nation, and with good reason. Think about it, Florida has beautiful beaches, rivers and lakes, endless recreational activities, amazing restaurants, plenty of shops and local attractions, world-class fishing, and best of all amazing weather. 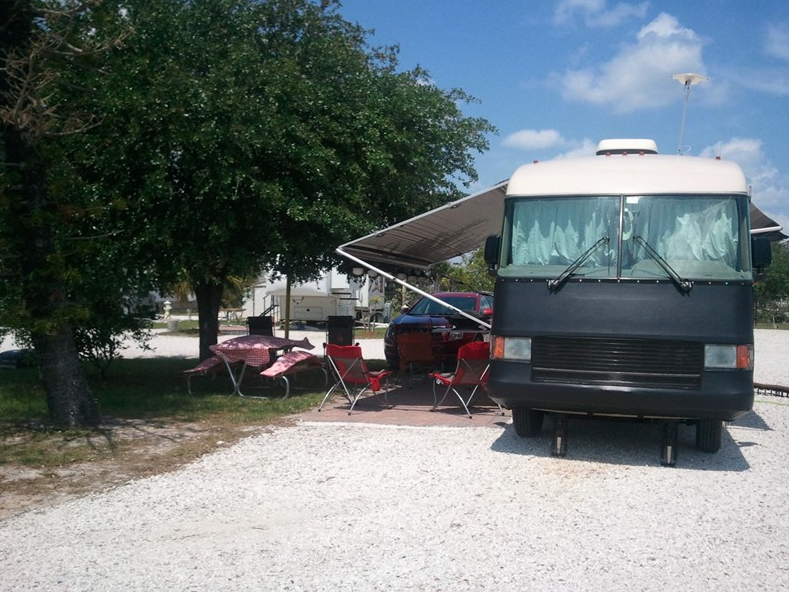 Florida has hundreds of the best RV Parks and campgrounds in the nation, so whether you’re parking the RV or pitching your tent, Florida has you covered. Grab the kids, grab the dog, grab the sunscreen, and grab your swimsuits, because you’re in for one fun family camping adventure! PRO TIP: Keep all of your phones charged with this 5 port USB charger that takes care of people in the front and back. It’s awesome. 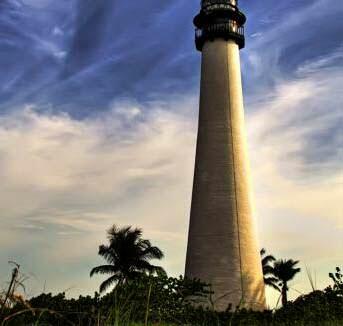 This campground features an iconic and historic lighthouse built by Mark Honeywell in the late 1930s. Even more interesting, the lighthouse was never actually intended to guide ships to safe passageways, but to actually entice them to come see the beautiful scenery at the park. You can only access this park by boat. How cool is that? 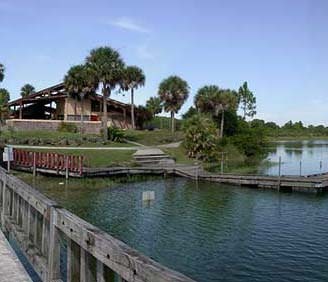 The campground includes picnic tables, barbecue grills, and toilets. You will find no electricity, drinking water, sinks, or showers on the island. Keep in mind all visitors must pack out their own trash, mosquitos inhabit the island year round, boats may raft no more than two deep, and pets are not permitted on the island or boats in the harbor. 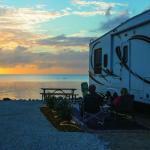 The views from the Elliot Key Campgrounds are beyond this world. The only access to the island is by boat, and camping is on a first-come, first-served basis. Keep in mind you also cannot make reservations in advance. Once upon a time, the park’s largest island even consisted of a community of pioneers who thrived off of pineapple farming, sponging, wrecking, and other pursuits. Today you can go camping, picnicking, wildlife watching, fishing, swimming, and hiking on the island. There are even restrooms with cold water showers available here. You can find the campground on the Biscayne Bay side of the island. 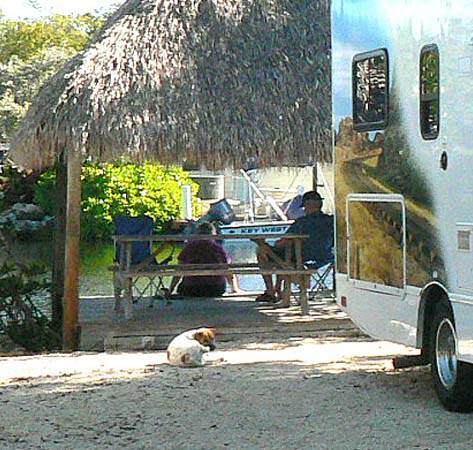 The Miami Everglades Resort was selected as 2010’s “Best Campground in Miami,” and for good reason. The campground features 34 acres of tropical camping paradise among avocado, mango, and palm trees. You’ll find yourself surrounded by tropical floral nurseries and farms, but still conveniently located near many other attractions in the area. Everglades National Park is less than 10 miles away, so don’t forget to check that one out! 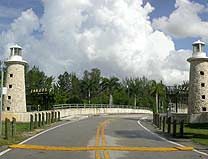 Florida’s largest urban park, Oleta River State Park can be found on Biscayne Bay in the busy Miami metropolitan area. The park is best known for its miles of off-road biking trails, which range from novice to challenging trails. 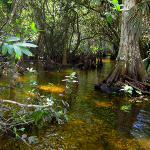 There’s also a large stand of beautiful mangrove forest preserves native South Florida plants and wildlife. Canoers and kayakers can paddle the river, exploring everything the natural area has to offer. 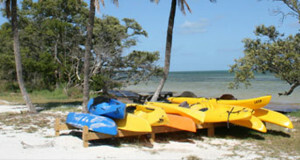 Visitors can rent canoes, kayaks, and bicycles from the park concessionaire. You’ll also find various picnic pavilions available for use. 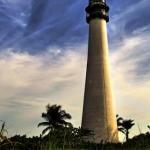 Bill Baggs Cape Florida State Park is full of fun adventures, but keep in mind that this isn’t your ordinary kind of camping. In order to camp here you’ll need to be “boat camping,” also known as anchoring overnight in No Name Harbor. 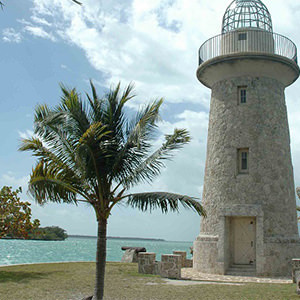 For starters, it’s home to a historic lighthouse built back in 1825 and reconstructed in 1846, and it’s even the oldest standing structure in Miami-Dade County. Head to this park to sunbathe, have a picnic, and go swimming all on more than one mile of sandy Atlantic beachfront. 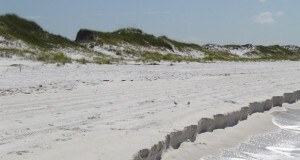 Did we mention it’s ranked #7 on the list of “Top 10 Beaches in America” by Dr. Leatherman? Just trust us. It’s amazing. 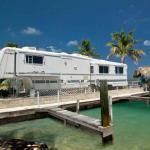 This tent and RV friendly campground and marina is located on the 18-mile stretch at the North end of the Florida Keys. You’ll soak up sunshine and have a fun, laid back adventure while visiting. 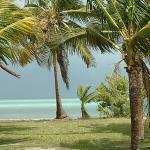 You can wander for miles on the beautiful Mangrove shoreline with canoes and kayaks included for your use by the. Maybe you’ll even get lucky and catch a glimpse of a dolphin! Here you’ll find yourself in the heart of the Florida Keys. 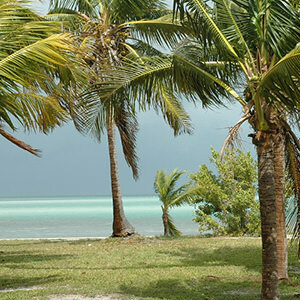 The Fiesta Key RV Resort will be your doorway to exploring lush greenery and tropical adventures across their 28-acre resort located on its own island. Find yourself surrounded by incredible Gulf of Mexico ocean views. 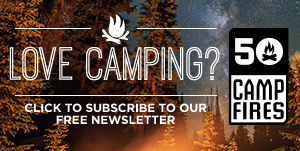 You have the option to hook up your RV, check into one of their rentals, or pitch a tent! You can’t go wrong! 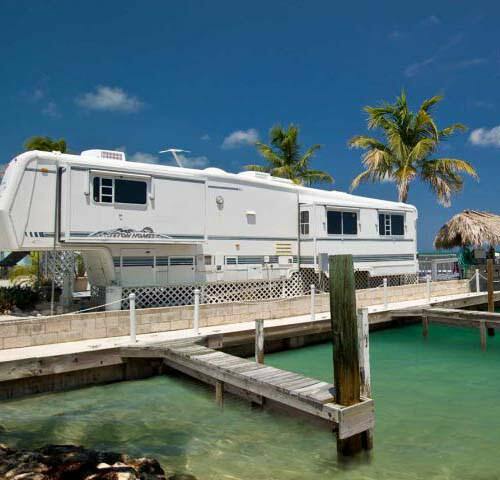 At just over a two hour drive from Miami, San Pedro RV Resort & Marina provides ultimate comfort and relaxation. Like you’d expect anything else in the Florida Keys right? If you prefer swimming with fish and frolicking with dolphins, there’s lots of opportunities for that. And if you’re into fishing, you’ve absolutely come to the right place. The kids might enjoy a trip to the nearby Theater of the Sea Marine Mammal Adventure Park after that swim with the dolphins. As for outdoor recreation, you’ll find a waterfront public facility with a marina, boat ramps, bocce ball courts, white sand beach, baseball fields, and even an Olympic-sized swimming pool. 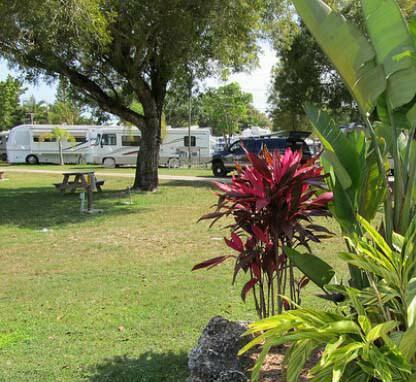 You’ll find Calusa Campground Resort and Marina located near John Pennekamp Coral Reef State Park. 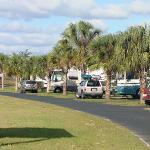 This campground even has its own canal and access to Florida Bay and the Atlantic Ocean. 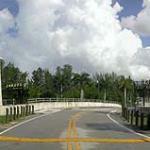 There are inland, canal, and bay-front RV sites which all come with 30/50-amp electricity, sewer, and water. For activities, hit up the swimming pool, playground, basketball and tennis courts, and recreation room. Our top pick is checking out the marine life. 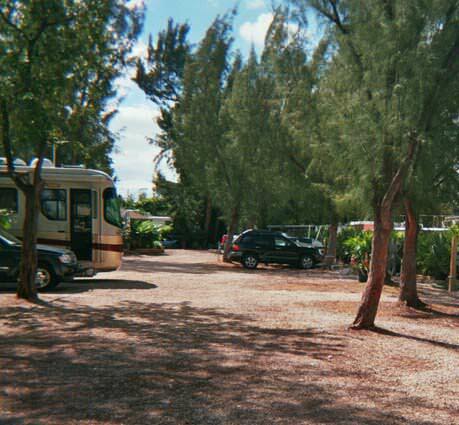 The Key Largo Kampground is more than just an ordinary campground, it’s also an RV park and marina on the edge of a coral reef. How cool is that? They’re located on 40 acres of tropical flowers and foliage, offering spectacular wildlife viewing opportunities alongside the Atlantic Ocean. Warm waters from the Gulf Stream are enough to entice you into a coral reef snorkeling, scuba diving, or fishing adventure. 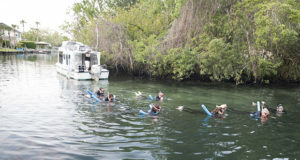 Key Largo just happens to be Florida’s “Dive Capital,” with more than 25 dive shops and charters to choose from. The Carlos Arboleya Campground has some pretty unique history behind it. In fact, Carlos Arboleya led a one-man campaign against a group that wanted to convert the camping grounds into a velodrome. Thanks to his dedication and hard work, he won the fight to preserve the grounds and build the velodrome somewhere else. So go ahead, take a load off and camp at the Carlos Arboleya Campground. 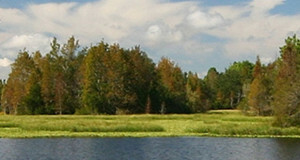 Easterlin Park is a 46.6-acre Designated Urban Wilderness Area. It’s the perfect example of what a cypress and mixed cypress forest should look like. You can easily find Cypress trees here that are 250 yards old and 100 feet tall throughout the park, not to mention a scenic lake. 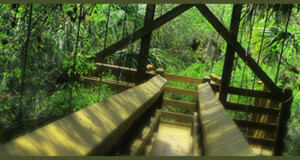 Make sure to check out the Great Florida Birding and Wildlife Trail as well. It truly is the perfect little oasis of nature. The campground has 45 full-hookup sites and six sites with partial hookups. Each site features a picnic table and a barbecue grill. The campground also has two restroom facilities with showers. 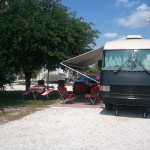 You’ll find Long Pine Key Campground near the entrance of Everglades National Park. 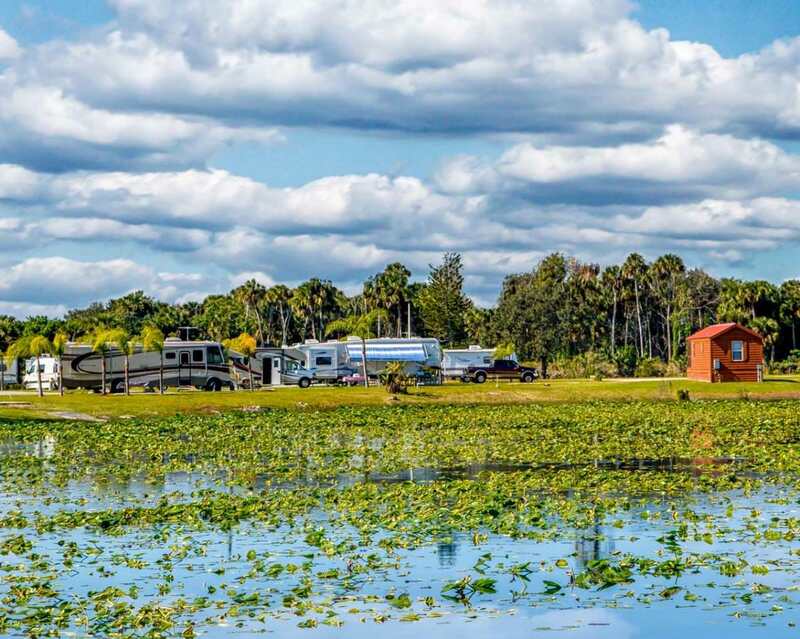 Here you will be surrounded in a forest of tall pines featuring large campsites that offer a good amount of privacy, yet you’ll only be a few miles from the Anhinga Trail at Royal Palm. 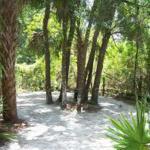 The seven-mile long trail, Long Pine Key Trail, also rests adjacent to the campsite. With 108 different individual drive-up sites for tents and RVs (available on a first-come, first served basis) you’ll have plenty of options here. Note that there is only one group site, which is available for reservation. 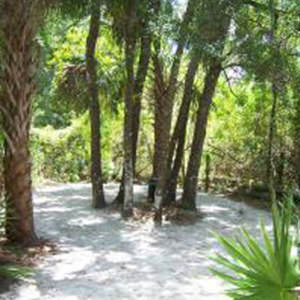 Larry and Penny Thompson Memorial Park and Campground is a unique campground, resting adjacent to the world-famous Miami Zoo. 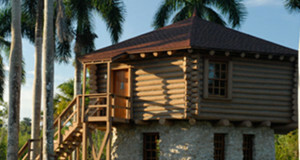 It’s a first-class camping area featuring 270 acres of natural South Florida woods, hiking paths, and bridle trails. You’ll find 240 different campsites available for recreational vehicles, offering full electrical and water hook-ups and even four large restroom and laundry facilities with hot showers. There’s even a camp store, picnic shelters, a jogging and biking trail, a large freshwater lake with its own beach and water slide, and more. 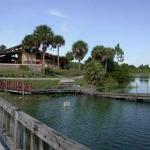 The Okeechobee KOA just happens to be the largest KOA with a 9-hole golf course. You’ll find tons of entertaining activities here for you and your family, and let’s not forget the many amenities offered. You’ll truly feel like you’re on a tropical vacation at this campsite. Check out the palm-fringed nine-hole golf course with a driving range and putting green. Hit up the fitness center, play some tennis on four courts, hike the trail or have a nice long soak in the pool. 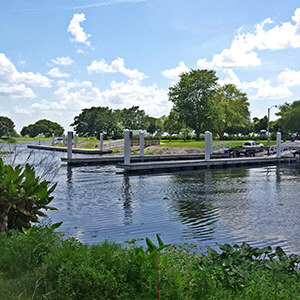 Don’t forget to go boating and fishing on Lake Okeechobee! Torry Island Campground is perfect for you and your gang if you love the water. 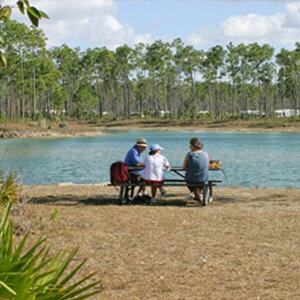 This campground features the second largest freshwater lake within the continental United States. 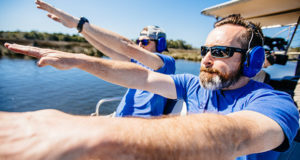 Lake Okeechobee’s 640 acre “Island Jewel” is bursting with wildlife and al kinds of historical treasures offering an array of natural wonders and recreational activities for all kinds of outdoor enthusiasts. 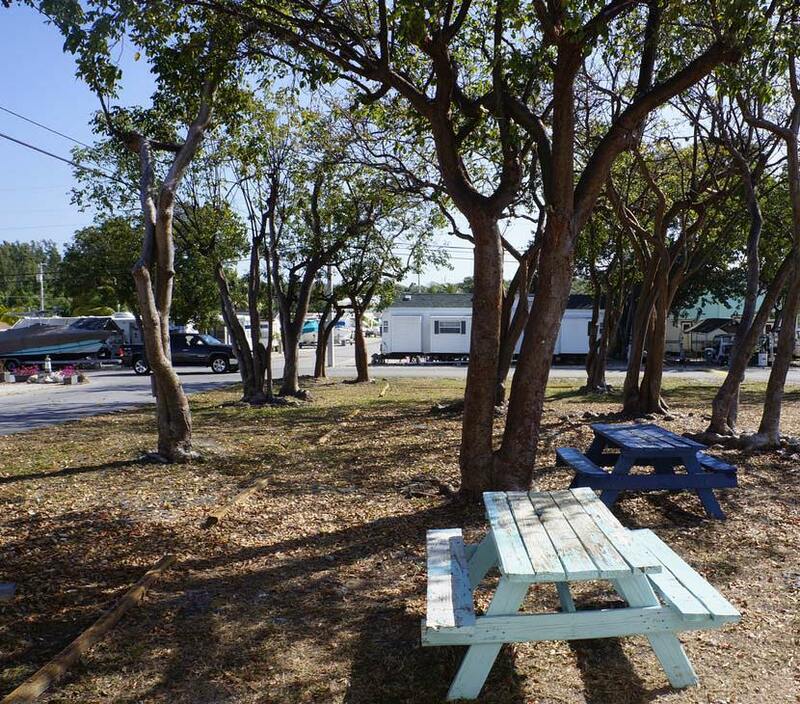 This campsite features premium full-hook up campsites, a children’s playground, security gates, covered pavilions, laundry facilities, and brand new six lane boat ramps with spacious parking. There’s even a bait and tackle store for all your fishing needs and an 18 hole golf course. 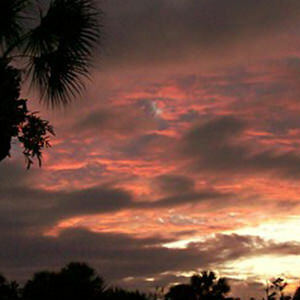 The Fort Pierce/Port St. Lucie KOA allows you to wake up in the morning watching the sunrise, and being only minutes away from the Atlantic Ocean. How cool is that? You’ll have endless opportunities to just kick your feet up and relax, enjoying a free shuttle ride to the beach and downtown Fort Pierce, a very historic port and inlet on the treasure coast of Florida. So go ahead, soak up the seaside breezes and concierge services. This is a comfortable, pet-friendly campground. Just wait for it… no mosquitos! 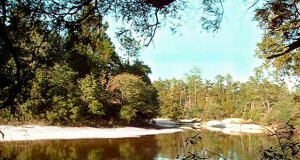 The Savannas Recreation Area is open for camping, rentals, and recreation a full seven days a week. This is an outdoor recreation area providing you with camping, fishing, and boating opportunities. 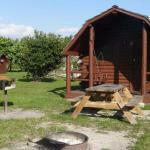 It even has picnic facilities for you to sit down and enjoy lunch with the family. Go sit on the wrap around porch and watch as the wildlife visits, or visit their gift shop to see many one of a kind items for purchase. The Savannas cover 550 acres and five different biological communities, providing access to wet prairie, pine flatwoods, marsh, lake, and scrub all just in a single glance. 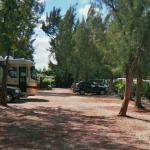 The Brighton RV campground can accommodate every size and class of RV. 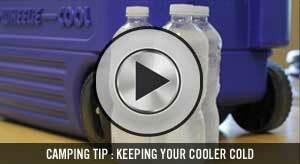 Whether you’re driving a motorhome, van camper, travel trailer, mini-motorhome, etc. all are welcome here. Every site is equipped with a picnic table, electric hookups, and water and sewer. Even better, if you don’t have an RV, this resort also has four brand new lakefront log cabins. Make sure to check out the swimming pool, ping pong table, restaurant, and barbecue station. 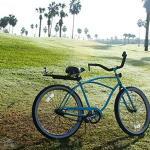 While visiting you can play soccer, go horseback riding, hiking, fishing, biking, play football, and more! Midway Campground is open year-round to campers. Offering a dump station, restrooms, day-use area, and drinking water, this is a great option to pitch camp. 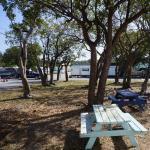 Midway Campground features 26 RV (with electric hookup) and 10 tent sites throughout the campground. Monument Lake Campground offers restrooms, drinking water, and a whopping 26 RV sites and 10 tent sites. Keep in mind there are no hookups for electricity, sewer, or water at this campground. 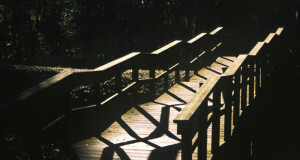 Sit at a picnic table and enjoy the surrounding preserve with friends and family. 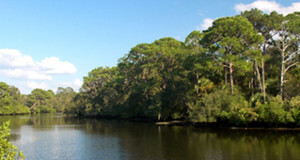 Nearby activities include fishing, hiking through the preserve, and exploring the multiple boardwalks. You won’t be disappointed with the views, as the RV campsites surround the lake, providing a magnificent view for each. Seminole Campground and RV Park will not disappoint you in the least. This campground offers RV sites with full hook ups. 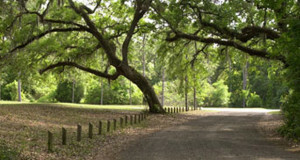 Their park is abundant in native oaks, cypress, and pine trees, which offer beautiful scenery on your hikes. 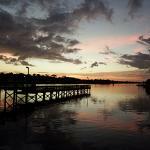 Seasonal fishing and canoeing is also offered nearby Caloosahatchee River. It’s the perfect location, being close enough for you to enjoy the many spoils of the Gulf of Mexico but also remote enough to be a very welcomed break from urban life. The W.P. 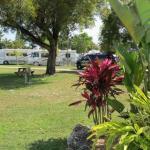 Franklin Campground is well known for it’s well maintained facilities and location on the Caloosahatchee River. Campers can fish, boat, and just relax in sunny Florida. The campground has been described as providing campers with a taste of “tranquil, tropical country life.” What could be better? 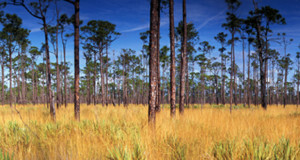 Try canoeing Florida’s backcountry swamps and viewing wildlife. You never know what you might find! 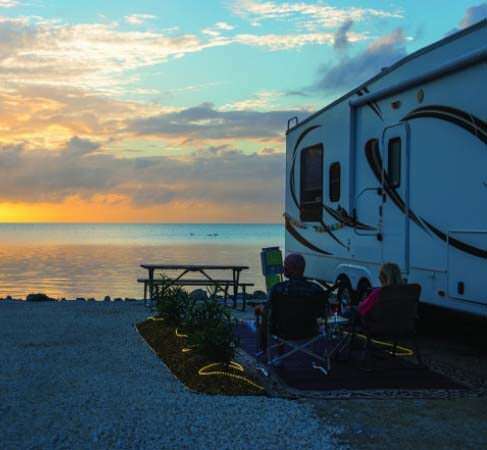 The Naples/Marco Island KOA is surrounded by the beautiful Rookery Bay Research Reserve, offering gulf beaches, everglades, and the community of Naples only a short drive away. The award winning Naples/Marco Island KOA allows you to reserve a rustic camping cabin or deluxe cabin. Tenters are always welcome as well. Don’t forget to check out the pool, hot tub, and canoe trail to the Gulf of Mexico!